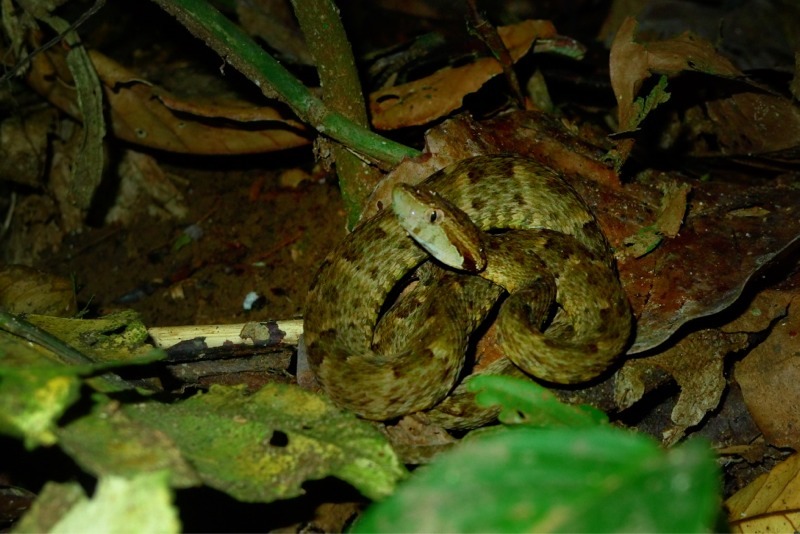 I’ve spent countless nights walking through rain forests in search of herpetological wonders. I remember my first few visits being completely overwhelmed by the stimulus and activity of a forest. I think this feeling is more so at night. Your vision is limited to just what is cast by your flashlights or headlamps. Even with a good light the vegetation usually stops you from seeing more than a few meters into the forest. Yet the sounds of activity are all around you. Your limited vision enhances these sounds. You can’t tell how high up is the canopy and the forest feels like it is consuming you. For the uninitiated the mind thinks of things unseen and unknown. Fears open up and sense of panic can ensue. In fact one doesn’t need to walk far into a forest to see the magic and experience some absolutely amazing creatures just going about life. I first entered these forests in hopes of seeing packs of jaguars, boas dripping off of every vine, dodging deadly spears, wrestling anacondas, and experiencing every terror and fear I’ve ever read about in Amazonian lore. And trust me there is lots of lore. In my years of doing this I have become jaded to much of the writings out there. For many of the biologically ignorant they interpret all that goes on out here as an assault on them. Their very survival is a conquest to boast to the world. I have no patience for this attitude. Assuredly mistakes in these forests can kill you. So can sending a text message while walking in front of a bus. I soon found my expectations were outlandish. But I was not disappointed. Every step I saw wondrous creatures I’ve never seen before. Katydids in all manner of color, size, and shape. Some of them, like most of the mantids and the amblypigids, looked like creations from H.R. Giger. Cockroaches scurry everywhere but some actually were brilliant and colorful. 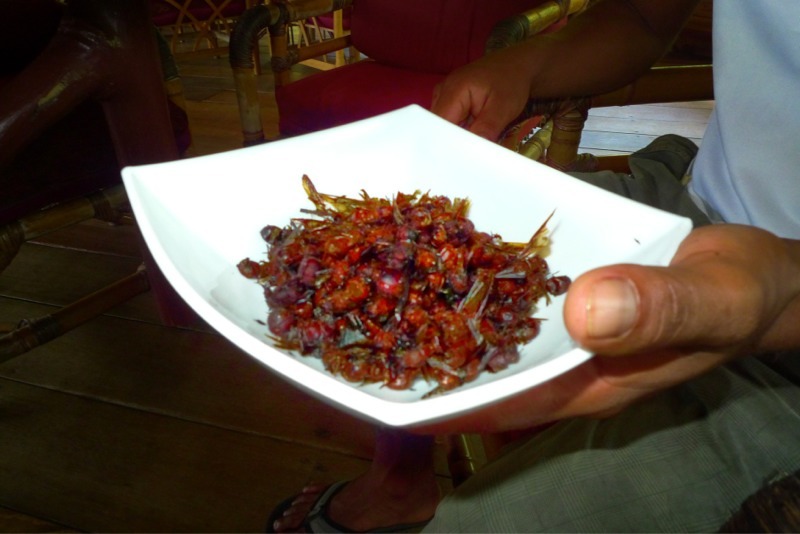 I saw giant crickets and grasshoppers, scorpions, innumerable spiders and tarantulas, stick insects a foot long, countless species of ants from lone giant bullet ants to leafcutters and army ant swarms that seemed in the millions. And of course there are the flying insects; most annoying the mosquitoes but also amazing bees, flies, wasps, alighted beetles, and countless others. In fact as I write I am stunned just how many animals and species I’ve come across. Damn there is some amazing life and life forms out here! 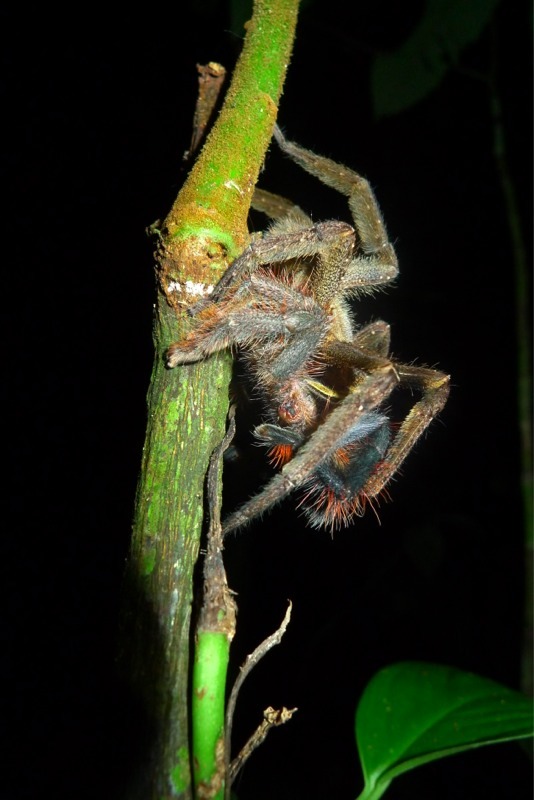 And every night they eat, get eaten, mate and reproduce, molt, crawl, slither, scurry, fly, and every other seemingly repulsive act you can imagine. And it is great! Over the years I have honed my forest craft. I fit in here. I can tell sounds and sights. I am familiar with the biology and feel comfortable here. That is not to say I know what is going on. Not by the slightest stretch of any imagination am I an expert. I could spend a lifetime here and not even be close to understanding this place. But it is a home for me. I have managed to find and see a couple hundred or so Amazonian reptiles and amphibians. In fact, usually when I find something it is a repeat of a past capture. But I still have a loooonnnng way to go. Sometimes I know what I’m hunting for but more often I am surprised or humbled. So far I have been out for 4 very long nights and a couple short day walks. After a couple nights of seemingly slow activity I had a feeling of dejection. I don’t know why. I caught myself feeling too familiar and too jaded by the life around me. 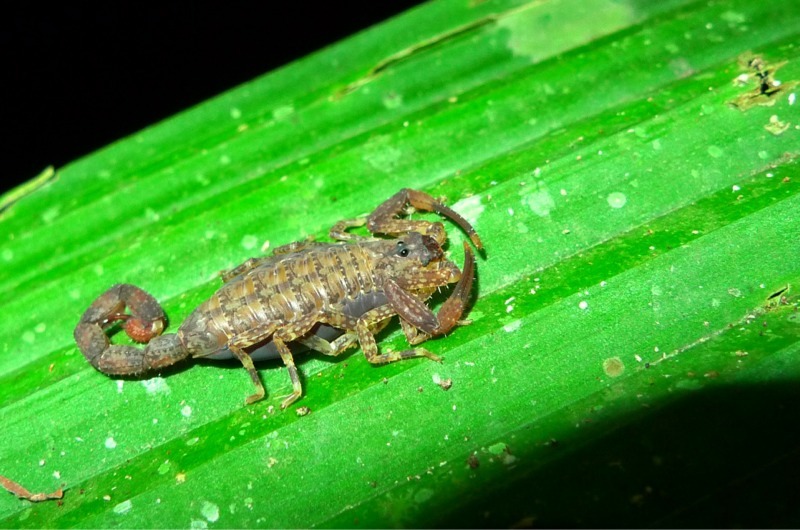 In my search for the perfect new snake or frog I was seeing and discounting all the other things that used to amaze me. Sure some were still annoying; like the millions (or is it trillions?) 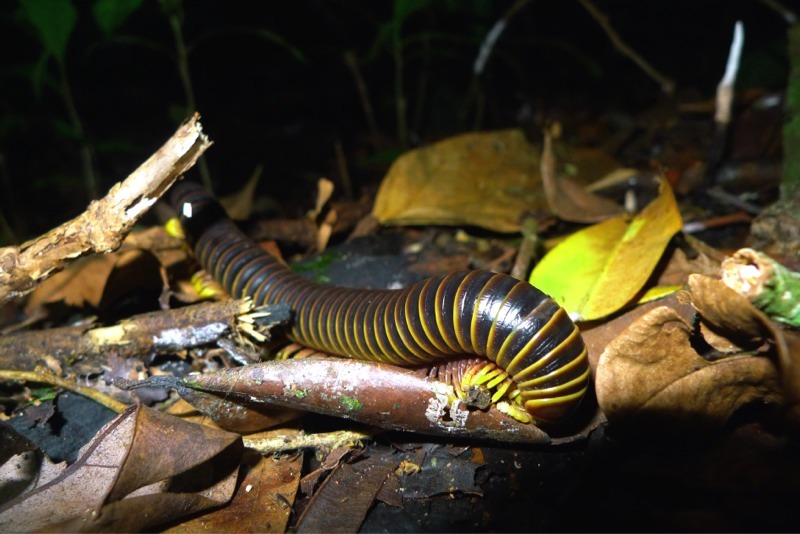 of 10cm long gray millipedes with yellow legs that cover, literally cover, the forest at night. These things are photosensitive so that as your lights hit them they thrash and writhe in agony. Or so it seems. Very distracting given their size and my hunting for moving snakes. 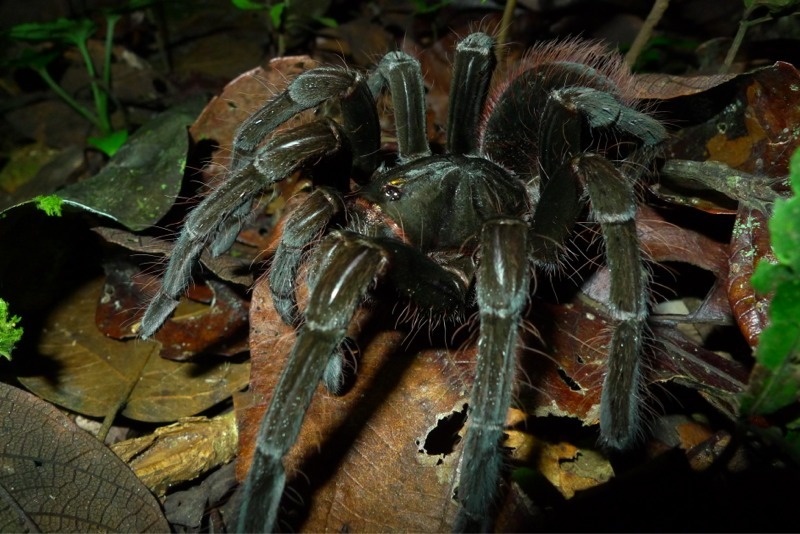 I have seen many tarantulas, maybe representing a dozen species, from small silver dollar size with flame orange bodies and electric blue legs to monsters as large as my hand. I had to remind myself that a cricket as large as a cigar is wondrous thing. 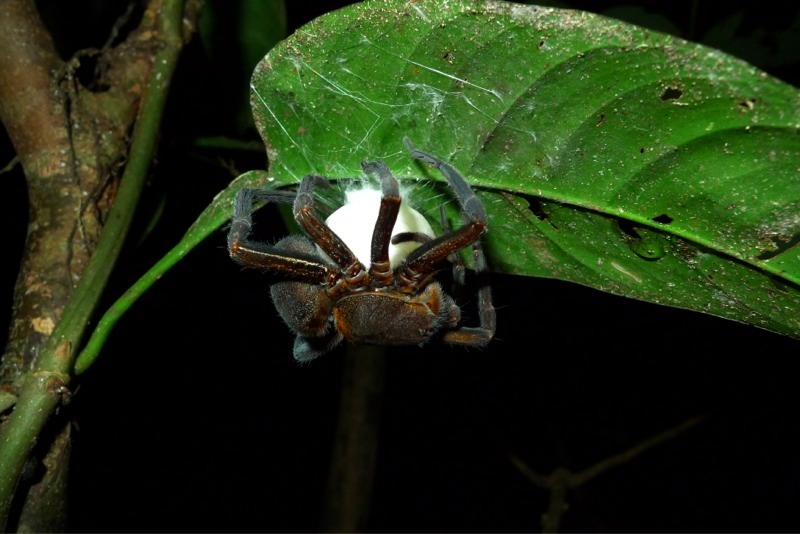 And that huntsmen spiders larger than tarantulas and fleet as any are an unnerving thing – especially when you see a huntsmen feeding on a tarantula. I’ve seen maybe a dozen species of millipede and a couple of centipedes. 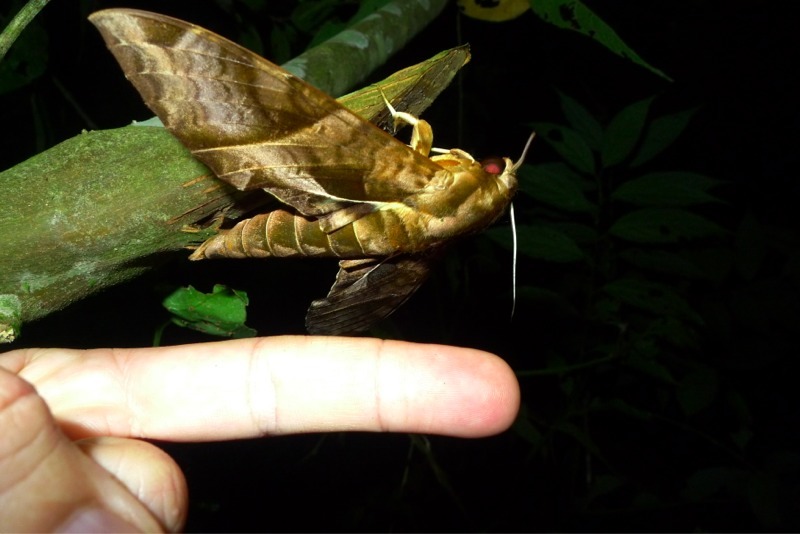 Beautiful butterflies folded asleep and giant moths that rival small birds are still around. I found long slimy flatworms with pretty yellow stripes and plain brown ones. I found a couple of Onycophorans again. The first had caught and was consuming a sizable roach. That is a biological find! I found myself thinking I could envision the world hundreds of millions of years ago to time when these ‘bugs’, as giants, ruled the earth. I have seen mammals: kinkajou, olingo, giant paca, deer, agoutis, several species of monkeys, the usual suspects so far. And of course many more to see. I have overlooked the birds for now. Mostly because I am out at night. I have caught them sleeping in their roosts but I don’t like to disturb them. If they take off they can’t see and have to crash into the forest to find a place of safety to sleep. Given that is has been hot and dry I’m at more than a couple dozen amphibian species – one new to me – so things are on track. The lizard assemblage has been fair if not typical with 8 species plus at least one uncaught gecko species. 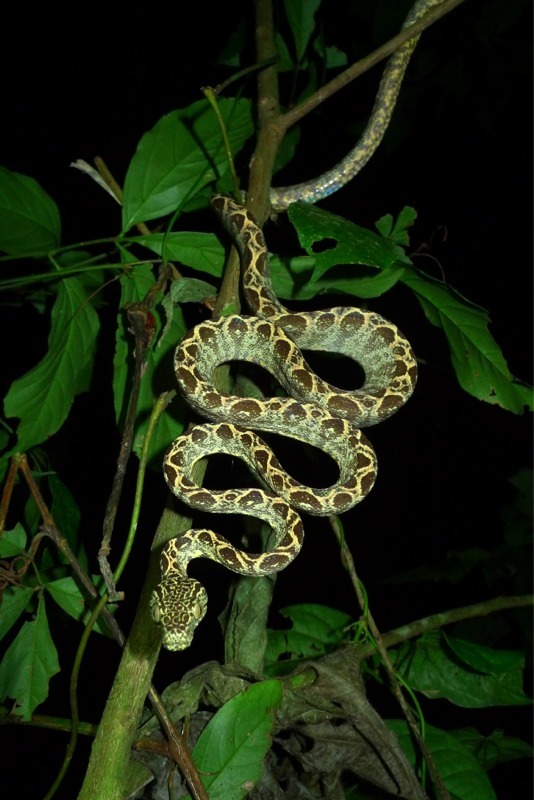 In my 4 nights I have tallied 13 snakes representing 8 species – 3 of those new. I’ve worked hard for the finds so far. This morning I’m catching up on writing and rest. The air is cooler today and clouds are moving through. Thunder is off to the east. After lunch I will photograph my captures and release them. Hopefully after there will be rain. My plans tonight will depend on the weather. There is just way too much to see and photograph and experience. My constant dilemma is what to do and accepting what I can get done. So that is another update from the field. These shots are simple point and shoot grab shots taken as I move about at night looking for snakes. Herping and photographing are mutually exclusive activities. I hope to better capture some of this stuff during dedicated attempts later. And remember this all being done on an iPad in the middle of the jungle with intermittent electricity and a sketchy satellite wifi connection. Now that is something to be amazed at. Your quality, like mine, will vary. I’m enjoying your posts, Tim. Good luck in your remaining adventures in Ecuador! Tim, reading this gave me itchy feet… the good kind of itchy feet that can only be satisfied by travel. I love your point and shoot images and am anxious to see your more serious work. 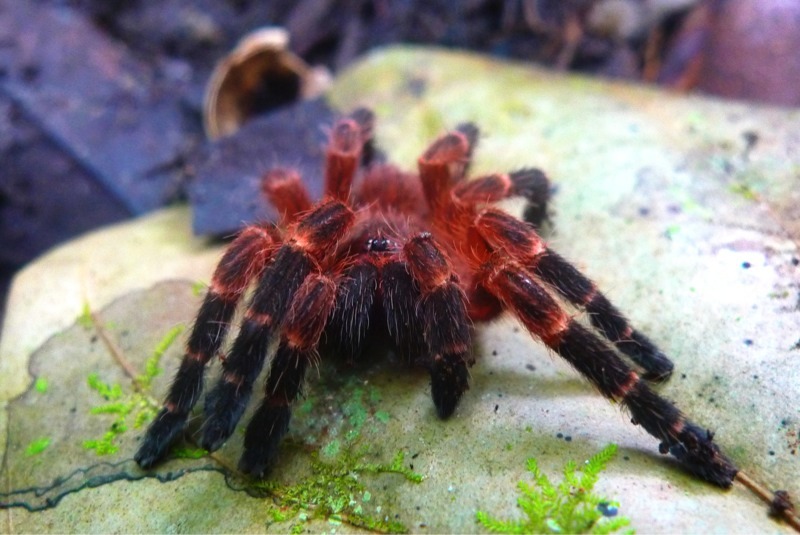 Try to get some more photos of that awesome red tarantula! I’m truly enjoying your new style of writing. It draws us into your adventures and feels like we’re there sharing it with you. Beautiful work and photos. Keep up the good work and thank you for allowing us to enter your world and the world of creatures most of will never see, hear, touch, feel. Most educational and inspiring. Another great post! It’s that horrible realization that the there are just too many things to see in the tropics… and no time to sleep. Great blog Tim. Your crisp but colorful prose and your exceptional photography skills open up an entire world for me. I can see why people are passionate in their pursuit and desire to protect these treasures. Thanks for publishing this. Loved your fascinating website – hope you are doing well! Your photos are wonderful and your writing is so interesting.